Πατήστε τη φωτογραφία και δείτε όλες τις φωτογραφίες του Luxury Apartment Kibella Beach. 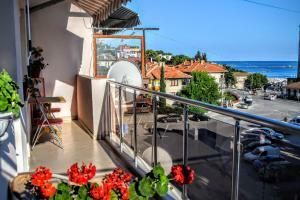 Luxury Apartment Kibella Beach, featuring a terrace, is located in Balchik, 3.4 km from The Palace of Queen Maria and 3.5 km from Botanic Garden Balchik. Guests can enjoy the free WiFi. The apartment features a balcony, 2 bedrooms, a living room and a well-equipped kitchen with a dishwasher. A flat-screen TV with cable channels is provided. Varna Airport is 49 km away. A security deposit of EUR 200 is required upon arrival for incidentals. This deposit is fully refundable upon check-out and subject to a damage inspection of the accommodation. Please inform Luxury Apartment Kibella Beach in advance of your expected arrival time. You can use the Special Requests box when booking, or contact the property directly with the contact details provided in your confirmation.